Celebrating Local People, Art & Enterprise - 40 pages of it - 4000 copies printed - The Coastie Summer Edition 2013/14! 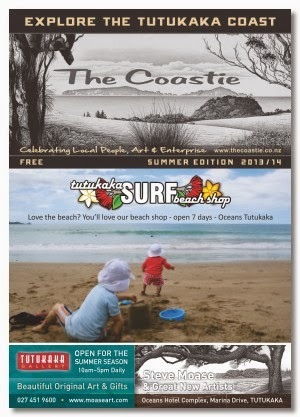 For the second year, the Coastie team is proud to present our free local magazine showcasing the Tutukaka Coast. Available from Tutukaka Coast venues and selected Whangarei cafes, restaurants, shops and through the Whangarei visitor information centres at Tarewa Park and at the Town Basin. IN THIS ISSUE - enjoy contributions from Kate Malcolm of Dive! Tutukaka, Guy Bowden of Tawapou Coastal Natives, Kate Broughton of VeganCuisine and of course our famous beach guide by Mal Egginton of Tutukaka Surf. Plus - we showcase stunning photographs by Iain Urquhart and Rob Plim and we endulge a little in beautiful artworks by Steve Moase & Friends, on offer at Tutukaka Gallery which has a new neighbour in Mi Casa Gallery. To celebrate local art, business, trades and services, you'll find a good selection in this issue. Why not enjoy lunch at Schnappa Rock, get your water from Ngunguru man Keith Whalley, have your bad back fixed by Dr Andrew Wallis, buy your presents at Tutukaka shops and galleries or get what you need locally at Toots Timber & Hardware - it's all here. And remember to visit the fabulous food and shopping places run by friends of The Coastie when you are in Whangarei next time. We hope we've created a visually appealing yet balanced design, placing advertisements in the right positions while entertaining our readers with interesting and useful information. There is even an excerpt from a brand new children's book recently published by local author Fiona Shirley Pope. Lastly, we'd like to say a BIG thank you to the team at Calders Print - Narrelle, Sharon, Garry, Jason and Chris - for their amazing support over this year and their guidance during the production of the Coastie Summer Edition. You guys simply rock! Also, Scott Brooks of Creative Shack for his design contributions. And a HUGE thank you goes to all our advertisers, sorry I couldn't mention everyone in this post, we hope we've done a good job helping to promote your business, after all it's your investment that makes all this possible! You can pick up a Summer Coastie in Whangarei from the i-sites, the Fat Camel in Quality Lane, Himalayan Trading Post, Tuatara Design Store and Paper Bag Princess in Bank Street as well as Reva's at the Basin. We'll be resuming weekly Coastie publication in February 2014. Wishing you a fabulous, relaxing, exciting and most of all - FUN summer on the Tutukaka Coast! Copyright (c) 2012 - 2018, The Coastie & Dimitri Frost, Ngunguru, Tutukaka Coast.. Picture Window theme. Theme images by konradlew. Powered by Blogger.